Pattern imprinted concrete driveways Manchester wide, are fairly new, but have quickly become a popular choice for homeowners; no doubt due to its hard-wearing and low maintenance qualities. Not to mention the beautiful range of colours and designs you can choose from. Using a highly innovative method, Pattern Imprinted Concrete Manchester is created by stamping the surface of freshly poured concrete to create the look of a beautiful mosaic of brick, cobbles, slate and stone. Similar to block paving, Pattern Imprinted Concrete Manchester uses specially formulated concrete mix which is poured directly onto the site. To get the individual look of the surface, dry shake colour hardener is brought to the surface and stamped with either powdered or liquid release. Flexible polyurethane texture mats are used to achieve the desired texture. Once you have you Pattern Imprinted Concrete Manchester & Cheshire driveways, all you need to do is keep it clean and re-seal it every 3 years to keep it in pristine condition. Here at Planet Surfacing, we have over 20 years’ experience creating stunning driveways through the use of Pattern Imprinted Concrete Manchester. All our driveways are of the highest quality and our top priority is making sure we deliver the highest level of customer service. We have over 20 colours for you to choose from with more options constantly being added. 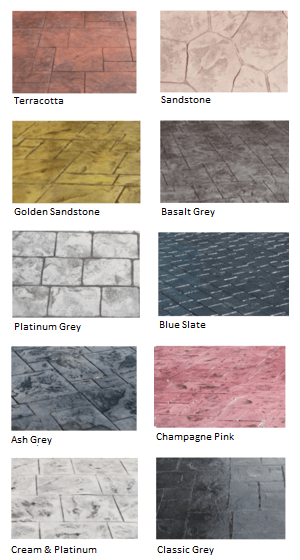 If you would like to see samples of our work or you need some of the best driveways Manchester can provide, please don’t hesitate to contact us here at Planet Surfacing. A member of our team will be more than happy to provide a sample swatch.